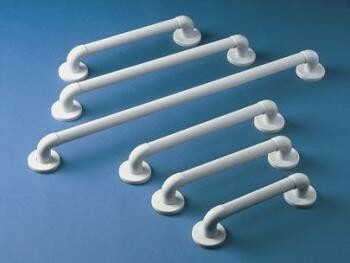 This cost effective range of plastic grab rails is made from white PVC tubes with moulded end fittings. They have circular fixing plates which have a covering disc supplied that clips into place, hiding the screw heads. The tubes are fluted along their length to provide better grip for wet hands. Note: We recommend that for maximum safety, all grab rails are installed by a qualified tradesman. Diameter of tubes 38mm (11/2"). Distance from wall 50mm (21/3").